Live classes and online friendships aim to combat isolation and promote wellness. Nassau County, NY - October 12, 2014 - The Selfhelp/Kimmel nonprofit partnership is expanding the nationally acclaimed Virtual Senior Center (VSC) initiative to a select number of homebound seniors in Nassau County. The VSC, already available in Queens (NY), Chicago, San Diego and Baltimore, is an innovative program using technology to easily connect homebound elderly through live interactive classes and online activities to help thwart the deleterious effects of social isolation. Planning for the expansion to Nassau was made possible by a grant from the Long Island Community Foundation, and implementation of the program by a $100,000 grant from the Unitarian Universalist Congregation at Shelter Rock (UUCSR) in Manhasset and supporting grants from the Manhasset Community Fund and Hofstra University’s National Center for Suburban Studies. The Long Island VSC launches officially October 7, with a special preview for community groups and a media event, featuring a live class demonstration and offering the opportunity to speak with participating seniors as well as the program sponsors. The initial curriculum of local live classes will be hosted by the Glen Cove Senior Center, the Sid Jacobson Jewish Community Center in East Hills and the Magnolia Senior Center of Long Beach. Classes will include current events, painting, the history of Long Island and more. Recruitment of the 24 Long Island senior participants began in August and is ongoing. A separate grant from The Manhasset Community Fund’s Good Neighbor Grant program will help identify and prepare an additional four seniors, bringing the total pilot participation to 24 homebound seniors who will have access to a broad-based curriculum of interactive and discussion-oriented programming from across the country. Long Island-generated classes will be offered four times a week. Additionally, seniors will be able to enjoy the classes live at participating centers in Long Island over the course of the year. “This is a wonderful idea!” says Jamy Kanas Santoro, Long Island’s first Virtual Senior Center participant. “Due to health reasons I couldn’t physically get out to go to places where I could enrich my mind. Now I am busy with interesting classes, meeting new friends.” Jamy, who is an inspiration to many as a 10-year survivor of Stage 4 breast cancer, says “the VSC has the potential to become a great, great thing.” She enjoys a wide range of classes including special presentations by the Museum of Modern Art, music, and nutrition discussions through which participants enjoy swapping recipes. “Without exaggeration,” says David Dring, Executive Director of Selfhelp Innovations, “I can tell you the VSC is a life-changing experience. It promotes good physical and emotional health, dispels loneliness and can spark a new interest in life. You only need to see it once in use to believe its potential.” Dring has been meeting with community groups across the country to help expand access to the VSC as well as to develop high quality content. Since its inception in 2010 as part of a demonstration project involving Selfhelp, Microsoft and the City of New York, the Virtual Senior Center has grown to include an impressive variety of classes from hubs in four major cities. The VSC today boasts countless testimonials from the seniors themselves explaining how the VSC enabled them to re-engage with life – in a way that has had a profound impact on their outlook, health and emotional well-being. “This program is such a wonderful thing for seniors like me,” says Elizabeth Pula, who has been homebound for years. “I feel like I am with my peers. We are all alone, but connected. I am making friends with the other participants. It is just wonderful,” she adds. Selfhelp is in the process of gathering statistically significant and publishable outcomes data from the VSC experience, which will help quantify the physical and emotional benefits for seniors participating in the program. The VSC effectively helps to fight one of the most significant threats to emotional and physical health as we age…and that’s isolation. Often underestimated by the general public, health professionals have come to realize the profound and crippling effects loneliness can create, as reported in this recent article in LeadingAge Magazine. Selfhelp invites qualified individuals interested in facilitating a class to check out the requirements posted on Selfhelp’s website, or to contact Senior Program Administrator for Selfhelp’s VSC, Carmella Chessen, at cchessen@selfhelp.net. 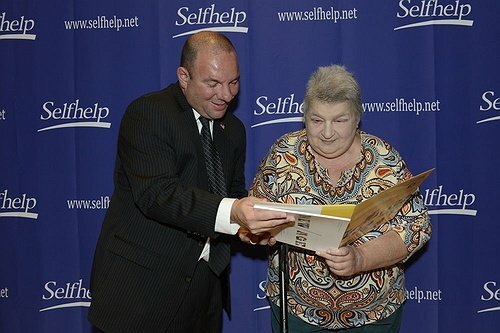 Selfhelp Community Services, which serves more than 20,000 seniors in the NYC-area, is a 78-year old nonprofit organization dedicated to maintaining the independence and dignity of seniors and at-risk populations through a spectrum of housing, home health care, and social services. It leads in applying new methods and technologies to address changing needs of its community. Selfhelp remains true to its founding mission to serve as the “last surviving relative” to its historic constituency, victims of Nazi persecution. Selfhelp and Kimmel formed a partnership in 2013, drawn together by their shared commitment to build housing and communities that promote the individual’s independence, health and well-being. Since its inception in 1994, Kimmel’s mission has focused on creating affordable housing for low and very low income people: seniors, working families, single heads of households, veterans and others with special housing needs. Established initially as the Anna and Phillip Kimmel Foundation, KHDF has developed and maintains two residential buildings in Nassau County recognized as models for suburban affordable rental housing. Founded in 1940, UUCSR has over 600 members and is the largest Unitarian Universalist Congregation in Long Island. Located in Manhasset, NY, we honor the diversity of beliefs and shared values of our members in serving our religious mission of worship, education for all ages, fellowship and social justice. We as a congregation aspire to be a loving, religious community where members can grow spiritually and build a more just and joyful world. Photo of Jamy Kanas Santoro, Long Island’s first Virtual Senior Center participant. Subject: LongIsland.com - Your Name sent you Article details of "Virtual Senior Center Coming to Nassau County’s Homebound Elderly"